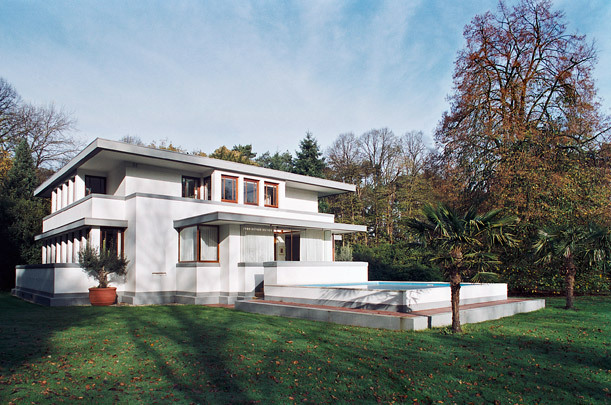 Robert van 't Hoff's fame rests almost entirely on his design for a villa for A.B. Henny, director of the Amsterdam clearing house (Amsterdamse Liquidatiekas). This was given extensive coverage in the magazine De Stijl. Van 't Hoff was a contributor of this magazine and together with Jan Wils represented an Abstract-Cubist architecture based on the work of Frank Lloyd Wright. Genuine De Stijl architecture came only later with Oud, Van Doesburg, Van Eesteren and Rietveld. The villa for A.B. Henny is one of the earliest domestic applications of reinforced concrete in the Netherlands. Virtually symmetrical in plan, its ground floor one metre above ground level contains the entrance, the kitchen and a full-width living room on the south side; the upper level contains bedrooms. The interiors are painstakingly finished with wooden mouldings, either left exposed or painted white, on ceilings and walls. The focal point of the living room is the fireplace. Villa Henny is centrally heated, the radiators and pipes being incorporated in four vertical shafts. In front of the house is a sheltered terrace and ornamental pool in a stepwise construction permitting a 'refined play of light and shadow'. Balconies and plant boxes complete the scene. All elements fit neatly within the compositional whole of the facades which are white-rendered with grey plinths, bands and awnings. The use of reinforced concrete gave great freedom in shaping the awnings and eaves, although the freedom of a column structure was scarcely exploited in either plan or facade. Horizontal strips of fenestration are divided into smaller units of equal size, their slightly narrower piers deviating little from the facade columns. The Henny family never lived in this house; in 1917 Henny sold it unfinished (the new owner calls it Huize Nora). The villa has had few changes made since it was built, the most obvious being the glazed recasting of the terrace as a conservatory. Several minor modifications, whether due to a change of client during building or resulting from Rietveld's alterations of the 1950s, invariably failed to meet with Van 't Hoff's approval, let alone excite his enthusiasm. Also by Van 't Hoff in Huis ter Heide are private house Løvdalla en private house Verloop.